Curious about what a project that concentrates the sun’s rays and turns them into steam looks like? 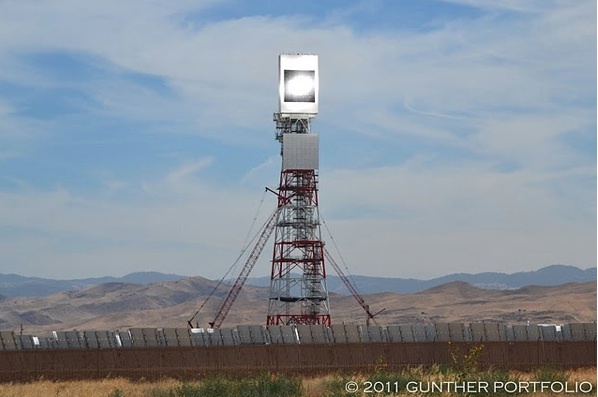 Solar blogger Ed Gunther just posted a half dozen photos of Chevron’s solar-to-steam project, which Chevron is building with gear from BrightSource, and which the oil company plans to use to recover more oil. The project is in Coalinga, Calif., and will have more than 7,000 mirrors concentrating sun light onto the central boiler. Gunther says the project appears to be on track to begin operations in the second half of 2011. To read more of Gunther’s analysis check out his post, and have a look at the photos below. Images courtesy of Gunther Portfolio. The ones Spain built are beautiful. Leave it to Chevron to make them look like an oil rig….